Remember my spinner’s study series? I know, I know, it’s been far too long (since April!). For those unfamiliar or those who might have forgotten (woops), I’m doing a bit of a breed study where I spin about an ounce of wool from different breeds of sheep and summarize characteristics of each one using the handy, dandy Fleece and Fiber Sourcebook by Deborah Robson and Carol Ikarius and various breed association websites as my sources. I do the breed research in the ‘start’ post and I also record my own thoughts/opinions on the way the fiber spins and the characteristics of the yarn in the ‘finish’ post. I’ve linked to posts for all the breeds I’ve done so far on the ‘Spin-Tastic!’ tab. We left off last time finishing a skein of Romney and starting to spin Cheviot. Even though my initial impressions of the wool were fairly mild, it turns out that I ended up hating spinning Cheviot. That ‘chalky’ characteristic described in the F&F Sourcebook turned out to be a problem for my spinning. I noted that the wool wasn’t exactly silky/shiny but it didn’t feel very grabby, either, and this lack of ‘grabbiness’ caused my single to break and spindle to drop constantly. It was really annoying and just did not feel good in my hands. You can see the resulting skein was very loosely spun and thick-and-thin in many places. This fiber and I just did not get along. That’s not to say that there aren’t excellent uses for it or that other people wouldn’t enjoy it, but let’s just say it’s not very high on my “breed to raise in the future” list. Now, onto the next: Romeldale. Photo credit Reflection Farm from the breed association page (click for link). Romaledales are actually quite variable in appearance, with CVM (California Variegated Mutant) sheep being a particularly colored variant of the breed. 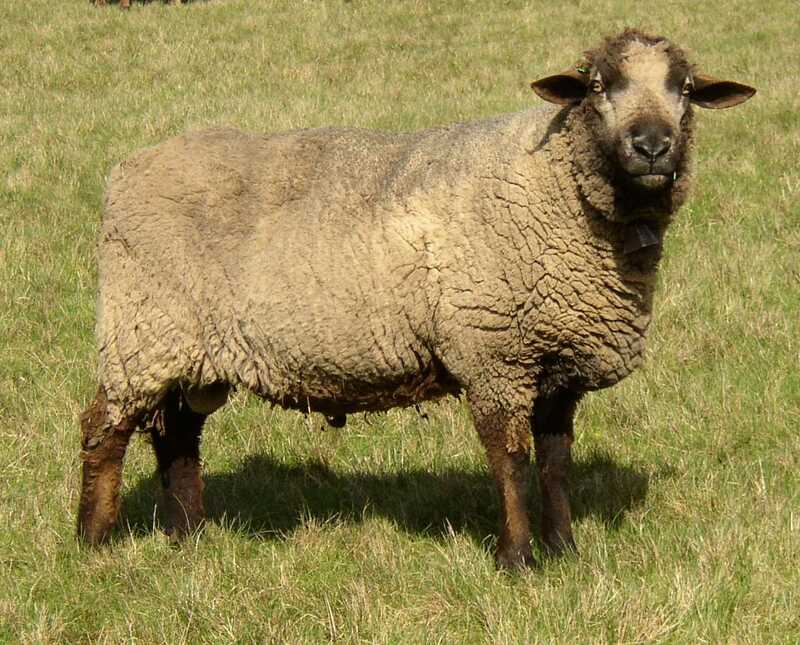 The breed was developed in 1915 when A.T. Spencer crossed his Ramboillet sheep (a French-modified descendent of Spanish Merino sheep) with a New Zealand Romney (a longwool) to add length and strength to the wool. The breed was only ever raised in the western U.S. and has been classified as critically rare. The only reason any CVM’s exist is because handspinners wanted their colorful fleeces (go spinners!). As for spinning, this stuff is about as different from Cheviot as you can get! It is very soft and has lots of crimp that makes it plenty grabby. The top I have is very dense and has a bit of a lanolin feel to it, which makes sense since sheep in the Merino family tend to have lots of grease in their wool. The F&F Sourcebook says that the wool is great for soft, lofty yarns because all of the disorganized crimp gives the yarn lots of bounce and resilience. It is spinning up easily and is producing a fine, soft single. I like it very much so far. I like even more what spinning wool from rare breeds does for their conservation. It’s crazy to think that entire breeds of colorful sheep would not exist if it weren’t for people interested in handspinning their wool, since commercial enterprises only want consistent white wool. Making a difference, one fleece at a time! This entry was posted in fiber, sheep, SpinnerStudy, spinning and tagged sheep, spinning by shoelaceswitcher. Bookmark the permalink. I’m obsessed with the Fleece and Fiber Sourcebook, it’s such an amazing resource! I just came across your blog today and will definitely be checking out the rest of your Spinning Study posts!